4Applied Molecular Biology Unit, Faculty of Medicine, University of Coimbra, Coimbra, Portugal. Received June 4th, 2011; revised July 5th, 2011; accepted July 13th, 2011. Introduction: Multidrug resistance (MDR) is one of the major problems of chemotherapy. Overexpression of efflux pumps, such as P-glycoprotein (Pgp), multiple resistance-related protein 1 (MRP-1) and lung resistance protein (LRP) can lead to MDR. Verapamil and L-buthionine-sulfoximine (BSO) are two modulators of these proteins. This study aims to compare 99mTc-Sestamibi transport kinetics in human colorectal adenocarcinoma cell lines, in the presence and absence of the MDR modulators verapamil and BSO. Material and Methods: MDR proteins expression was evaluated in sensitive (WiDr) and resistant (LS1034) human colorectal adenocarcinoma cell lines. Intracellular and plasma membrane Pgp and MRP1, and LRP expression was analyzed by flow-cytometry and western blot. Cellular transport kinetics was assessed using 99mTc-Sestamibi. MDR modulation was evaluated though retention studies in resistant cells after incubation with the modulators. Results: Pgp expression was significantly higher (p ≤ 0.001) in resistant cells. These results were confirmed by western blot analysis. 99mTc-Sestamibi uptake and retention percentage were significantly higher (p < 0.001 and p < 0.01, respectively) in the sensitive cells for all time-points considered. In resistant cells there were no significant differences when we consider the curves as a whole, considering cells incubated versus non-incubated with MDR modulators. However, for the first minutes after incubation with 99mTc-Sestamibi, there were differences among the MDR modulators used (p < 0.05). Conclusions: In vitro kinetic studies using 99mTc-Sestamibi could indicate MDR phenotype in colorectal adenocarcinoma cells. As the modulators used showed a reversion of the retention profile only for the first minutes, their administration should occur immediately before the administration of cytotoxic drugs. Multidrug resistance (MDR) is a condition defined by the cross-resistance to several non-structurally related drugs, observed in several hematologic and solid tumors. It represents one of the major problems to the success of chemotherapy, as drugs do not take effect on tumor cells . Several mechanisms have been described to explain this phenomenon: 1) changes in drug and plasma membrane interaction, 2) drug metabolism modifications, 3) intracellular drug sequestration, 4) development of DNA repair mechanisms, 5) evasion of drug-induced apoptosis, 6) expression of vault particles, 7) changes in tumor microenvironment and/or 8) expression of cancer stem cells, which acquire most of the previous mechanisms . One of the best studied MDR mechanisms is the overexpression of efflux pumps, such as those belonging to the ATP-binding cassette (ABC) transporters superfamilly . ABC-transporters are preferentially expressed in plasma membranes, although they are also expressed in several intracellular organelles. Seven ABC-subfamilies have been described in humans, labelled from ABCA to ABCG [2,3]. These proteins are present in blood-brain barrier, blood-testis barrier, placenta, gastrointestinal tract, liver and kidney, playing an important role in the protection against xenobiotics and endogenous metabolites [2-4]. Fifteen ABC transporters, belonging to ABCB, ABCC and ABCG subfamilies, have been associated with MDR up to date . The first one described was ABCB1, also known as P-glycoprotein (Pgp), a 170 kDa glycoprotein that transports several not structurally-related substrates against concentration gradients [5,6]. These substrates are hydrophobic, have a molecular mass between 300 and 2000 kDa and most are cationic at physiologic pH . Another ABC transporter associated with MDR, identified in 1992, is ABCC1, also known as multidrug resistance-related protein 1 (MRP-1) . It has a molecular weight of 190 kDa and recognizes most of the cytotoxic substrates that are recognized by Pgp, despite only presenting a 15% homology with this pump. It also transports lipophilic anions by conjugation with glutathione, sulfate or glucuronate or by co-transport with glutathione without conjugation [6,9,10]. Overexpression of vault particles is another described mechanism for resistance. Vaults are ribonucleoprotein complexes that have been detected in several organisms and are composed by different proteins. One of them, the major vault protein, discovered in 1993 and named lung resistance-related protein (LRP), has been associated with MDR as it is overexpressed in several resistant cell lines [11-13]. Pharmacologic inhibition of MDR transporters is the major strategy to overcome this phenotype. The drugs used can either be a substrate of these transporters, modulating their activity by competitive inhibition, or they can induce conformational changes in these proteins, preventing substrate recognition or ATP hydrolysis. Verapamil, an L-type calcium-channel blocker and a first generation MDR modulator, modulates Pgp and MRP-1 activity [14,15]. Other MDR modulators were developed aiming to reduce toxicity and increase efficacy . Another way to functionally inhibit MDR pumps is depleting the cell from substrates essential to its function. L-buthionine-sulfoximine (BSO) is an inhibitor of γ-glutamylcysteine synthase, an enzyme involved in de novo synthesis of glutathione. Consequently, the glutathione reduced levels within the cell lead to a lower activity of the glutathione-dependent pump MRP-1 . 99mTc-Sestamibi is a radiotracer used in myocardial perfusion studies. Its uptake occurs by passive diffusion due to transmembrane electric potential, and it accumulates in mitochondria . This radiotracer is cationic and mildly lipophilic, which are common characteristics of several substrates of MDR efflux pumps. Therefore 99mTc-Sestamibi could be a possible probe for functional activity of this type of proteins . In this study we aim to compare 99mTc-Sestamibi transport kinetics for two human colorectal adenocarcinoma cell lines, one sensitive and another resistant to chemotherapy, in the presence and absence of MDR reversers, verapamil and BSO, using 99mTc-Sestamibi. Sensitive WiDr and resistant LS1034 human colorectal adenocarcinoma cell lines were obtained from American Type Culture Collection (Rockville, MD, USA). These cell lines were cultured in 5% CO2 atmosphere, at 37˚C using Dulbecco’s Modified Eagle’s medium (DMEM, Sigma) for WiDr cell line and Roswell Park Memorial Institute-1640 (RPMI-1640, Sigma) for LS1034 cell line, both supplemented with 10% fetal calf serum (Gibco) and 1% of antibiotic-antimycotic (Gibco). Flow Cytometry Studies: In order to characterize the expression of MDR proteins, membrane and intracellular Pgp and MRP-1 and intracellular LRP were assessed by flow cytometry using monoclonal antibodies labelled with fluorochromes. The analysis was performed using a six-parameter, four-color FACSCalibur flow cytometer (Becton Dickinson, San Jose, CA) equipped with a 15 nW argon laser. For each assay, 106 cells were used and data on at least 10.000 events was collected using Cell Quest software (Becton Dickinson) and analyzed using Paint-a-gate software (Becton Dickinson). For each labelling 1 × 106 cells were used. For membrane MDR proteins detection cells were centrifuged at 300 g and incubated for 15 minutes at room temperature with the monoclonal antibodies: anti-human Pgp (fluorescein isothiocyanate (FITC) mouse anti-human P-glycoprotein, BD Pharmingen), anti-human MRP1 (FITC mouse anti-human MRP1, BD Pharmingen) or anti-human LRP (mouse anti-Human LRP (LRP-56), Santa Cruz biotechnology, Inc). Cell cultures treated with anti-human LRP were also incubated for 20 minutes at room temperature with a second antibody labelled with Phycoerythrin PE. Cells were washed with phosphate buffer saline (PBS; in mM: 137 NaCl, 2.7 KCl, 10 Na2HPO4, and 1.8 KH2PO4 [pH 7.4]), through centrifugation and ressuspended in the same buffer. For intracellular protein detection, the cells were previously fixed with Reagent A (Intracell Kit, Immunostep) during 15 minutes at room temperature, and after wash, by centrifugation at 300 g during 5 minutes with PBS, cells were permeated with Reagent B (Intracell Kit, Immunostep) and incubated with the same monoclonal antibodies as described above. Western Blot Analysis: Both cell lines were cultured in 25 mm Petri dishes in order to prepare the protein extracts. Cells were washed twice with cold PBS, and lysed in Ripa buffer (150 mM NaCl, 50 mM Tris, 5 mM EGTA, 1% Triton X-100, 0.5% DOC, 0.1% SDS) supplemented with complete miniprotease inhibitor cocktail tablets (cOmplete Mini, Roche). Protein concentration was determined by bicinchoninic acid (BCA) protein assay (Pierce Biotechnology) and samples containing equal amount of protein were used for immunoblots, after adding 6× concentrated sample buffer (0.5 M Tris, 30% glycerol, 10% SDS, 0.6 M dithiothreitol [DTT], 0.012% bromophenol blue) and heating the samples for 5 minutes at 95˚C. Proteins were separated by 8% sodium dodecyl sulfate-polyacrylamide gel electrophoresis (SDS-PAGE), and transferred electrophoretically to polyvinylidene fluoride membrane (Amersham HybondTM-P, GE Healthecare). Prestained molecular weight marker proteins (Precision Plus Protein Dual Color Standards, BioRad) were used as standards for the SDS–PAGE. A ponceau staining was performed to verify the quality of the transfer. The membranes were blocked for 1 hour at room temperature in PBS containing 0.1% Tween-20 (TBS-T) and 5% low-fat milk. Incubation with the primary antibodies (Anti-P-Glycoprotein Mouse monoclonal antibody, 517310 Calbiochem) was performed overnight at 4˚C. After washing for 1 hour in TBS-T with 0.5% low-fat milk, the membranes were incubated for 1 hour at room temperature with an alkaline phosphatase-linked secondary antibody (anti-mouse IgG+IgM, NIF1316 from Sigma, 1:20,000 in TBS-T with 1% low fat milk). Immunoblots were developed using the Enhanced Chemi-Fluorescence system (ECF; GE Healthcare) and a Storm device (Molecular Dynamics, GE Healthcare). The membranes were then reprobed and tested for β-actin immunoreactivity (Anti-β-Actin Mouse monoclonal antibody, A5441 from Sigma, 1:5000) to prove that similar amounts of protein were applied in the gels. Preparation and Quality Control of 99mTc-Sestamibi: 99mTc-Sestamibi (Cardiolite®, Bristol-Meyers and Squibb) was prepared and then was performed quality control according to Abrantes et al. .
Uptake Studies and Retention Studies of 99mTc-Sestamibi: The uptake studies were performed as described in Abrantes et al. , at 5, 15, 30, 60, 90 and 120 minutes. Cell viability was assessed by trypan blue exclusion test at the conclusion of experiments. To perform retention studies the cells were submitted to the same procedures used in uptake studies to obtain the cell suspension at 2 × 106 cells/ml. After achieving steady state conditions, the radiopharmaceutical was added so that cells could uptake 99mTc-Sestamibi during one hour. Cells were then centrifuged at 1000 rpm for 5 min at 4˚C, followed by the aspiration of the supernatant and replacement by radiopharmaceutical free medium. Triplicate samples of 200 µL were removed to eppendorf tubes containing chilled PBS for determination of tracer retention at 1, 2.5, 5, 10, 15, 30, 45, 60, 90 and 120 minutes. Cell suspensions were then centrifuged at 5585 g for 1 minute, followed by aspiration of the supernatant. Radioactivity of cell pellets and supernatants were measured separately with a well-type gamma counter (DPC Gamma C12) to determine tracers’ retention percentage in the cells. Cell viability was assessed by trypan blue exclusion test at the conclusion of experiments. To perform cytotoxicity studies, cells were grown to 90% confluence and harvested by treating with 0.25% trypsin with 0.02% EDTA. For each experiment, cells were plated in 24 multiwells, in a concentration of 50000 cells/mL and kept in the incubator overnight, in order to allow their attachment. Cell plates were then incubated with different concentrations of verapamil (Sigma V4629) and BSO (Sigma B2515), ranging from 1 to 200 µM, and during different periods of time (24 h, 48 h, 72 h and 96 h). For every experiment two controls were performed, untreated cell cultures and cells incubated with the vehicle of administration of the inhibitors, dimethyl sulfoxide (DMSO, D8418) for verapamil and water for BSO. Each experiment was performed in duplicate and repeated in three sets of tests. The sensitivity of the cell lines to the previously referred drugs was accessed using the MTT colorimetric assay (3-(4,5-dimethylthiazol-2-yl)-2,5-diphenyltetrazolium bromide; Sigma–Aldrich, Inc.; Sigma M2128) to evaluate cell proliferation. Yellow MTT is reduced to purple formazan in the mitochondria of living cells . Therefore, the purple formazan products formation can be quantified measuring absorbance at the wavelength of 570 nm. 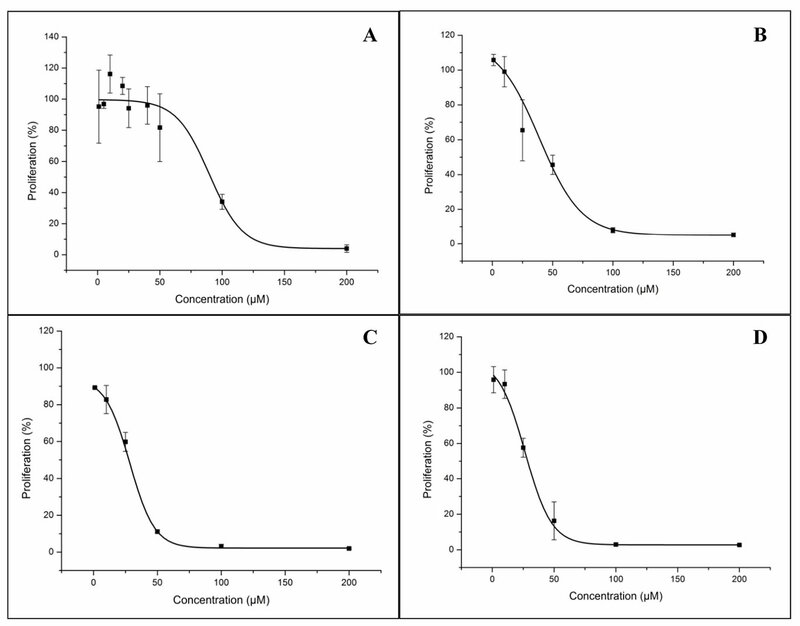 Cytotoxicity was expressed as the percentage of inhibition of cell proliferation correlated with the cultures treated with the vehicle of administration for each drug. This procedure allows the determination of the concentration that inhibits the culture cell proliferation in 50% (IC50). To evaluate MDR modulation, retention studies were performed in the resistant cell line (LS1034) in the presence of verapamil and BSO prior to incubation with 99mTc-Sestamibi. The procedure used was the same as described before; however, before adding the radiopharmaceutical, the cells were incubated for different periods of time (10 or 60 minutes) with different concentrations of Verapamil (25 µM, 50 µM and 100 µM) and BSO (10 µM, 50 µM and 100 µM). Results were analysed using Statistica package, version 7 and SPSS, version 16, at a significance level of 5%. For kinetic studies, time curves were compared as a whole by applying the general linear model (repeated measures ANOVA within time and one factor: incubation condition). For each time point, each condition was compared using one factor ANOVA test. To compare flow cytometry data Student’s t test for two independent samples was used, after confirming normal distribution by the Kolmogorov-Smirnov test. IC50 for each condition was determined by sigmoidal fitting (Boltzman function), using OriginPro, version 7. In Figure 1 is represented the expression level of the MDR proteins Pgp, MRP-1 and LRP. As we can observe, plasma membrane and intracellular Pgp expression analysed by flow cytometry was significantly higher (p < 0.001 and p = 0.001, respectively) in the resistant cell line, when comparing to the sensitive one (Figure 1(a)). However, these two cell lines do not express MRP-1, as we observe mean fluorescence intensity (MFI) lower than 10 (Figure 1(b)). There were no statistical differences (p > 0.05) between the two cell lines regarding LRP (Figure 1(c)). Pgp expression was also analysed using Western Blot techniques. As we can observe in Figure 2, after incubation with anti-Pgp antibody a higher staining intensity was detected in the resistant cell line, corresponding to the migration band of 170 kDa, which is consistent with a higher expression of Pgp (Figure 2). Incubation with anti-β-Actin antibody confirmed that similar amounts of protein were applied in the gel, as the staining intensity was similar in both cell lines (Figure 2). 99mTc-Sestamibi uptake studies: Uptake time curves of 99mTc-Sestamibi for WiDr and LS1034 cell lines are represented in Figure 3(a). An uptake peak can be observed after 60 minutes of incubation of WiDr with 99mTc-Sestamibi, with an uptake percentage of 18.86%. For LS1034, uptake percentage was mostly constant, varying between 1.36% and 1.85%. When we compare the two cell lines we observed statistically significant differences (p < 0.001) for every time-point considered, as well as when considering the curve as a whole. Cell viability was higher than 90% for all performed assays. Figure 1. Expression of Pgp (a), MRP-1 (b) and LRP (c) by flow cytometry in colon cancer cell lines. The expression of MDR proteins was assessed by flow cytometry using monoclonal antibodies in sensitive, WiDr, and resistant, LS1034, cells. Bars represent fluorescence intensity average (FIA). Error lines represent standard error for the mean. Statistical analysis: **p < 0.01; ***p < 0.001. Figure 2. Expression of Pgp by Western Blot analysis. The figure represents the Western blot membrane after incubation with anti-Pgp and anti-β-actin antibodies. Layers 1 and 2 correspond to LS1034 and WiDr, respectively. a mean of 24.75%. After one hour, both curves almost overlap at approximately steady retention percentages, with mean values of 6.51% for WiDr and 3.42% for LS1034. Figure 3. 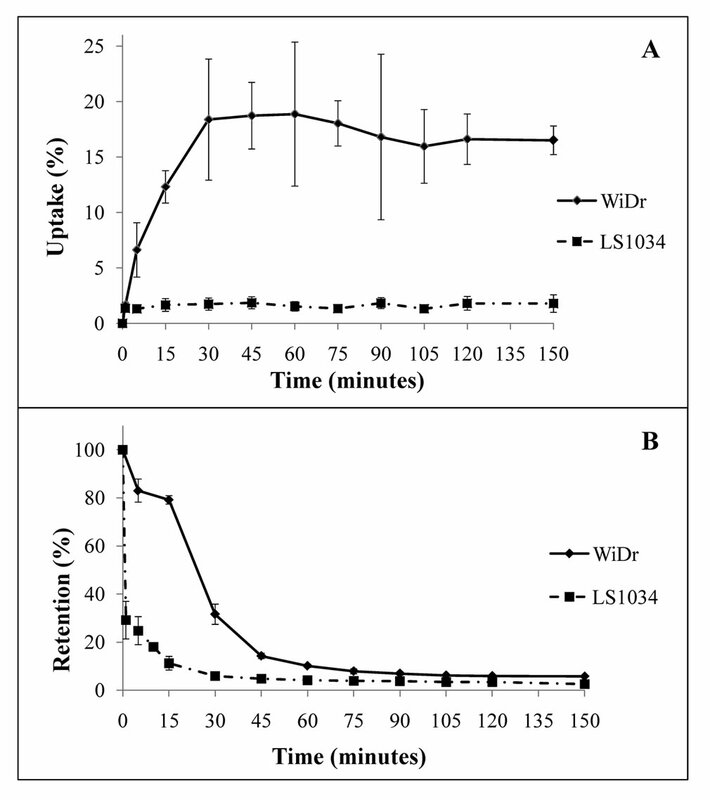 Uptake curves (a) and retention curves (b) obtained through 99mTc-Sestamibi for WiDr and LS1034 cell lines. Curves represent retention percentage through time. Error lines represent standard deviation for each time point considered. Table 1. IC50 values obtained for LS1034 cells incubated with verapamil for periods of time of 24 h, 48 h, 72 h and 96 h.
Figure 4. Verapamil dose-response curves for LS1034. The figure represents the effect of verapamil in LS1034 cells proliferation at 24 h (a), 48 h (b), 72 h (c) and 96 h (d) of incubation. Error lines represent standard deviation for each concentration point considered. Retention curves obtained are shown in Figure 5. Regarding the curves that represent the incubation with verapamil (Figure 5(a)), as a whole, there were no significant differences (p > 0.05) between the conditions studied. However, considering time-points of 1, 2.5 and 5 minutes, there were significant differences (p = 0.001, p < 0.001 and p = 0.017, respectively) between those conditions, that are due to a lower retention in cells that were not incubated with the modulator. There were no differences between different concentrations or periods of incubation for any of the time-points considered. Related to the cells incubated with BSO (Figure 5(b)), considering all the time-points, there are no statistical differences (p > 0.05) between the conditions studied. However, for time-points of 1, 2.5 and 5 min there were differences (p = 0.002, p < 0.001 and p = 0.013, respectively) between the retention percentages of those conditions, which was lower for LS1034 cell line incubated without the modulator. The main goal of this work was to evaluate the use of radioisotopic methods in identifying resistance mechanisms mediated by efflux pumps, using 99mTc-Sestamibi. This radiotracer is cationic and lipophilic, similar to the characteristics of ABC-transporters substrates . Therefore the expression of these proteins in tumor cells may influence the uptake and efflux kinetics of 99mTc-Sestamibi and, in this case, this radiotracer could give information about their expression and become an important diagnostic tool. Figure 5. Retention curves to study LS1034 MDR modulation, using verapamil (a) and BSO (b). Curves represent retention percentage through time. Error lines represent standard deviation for each time point considered. of resistance mechanisms that are present in these types of tumors. As ABC-transporters are expressed in normal intestinal epithelial cells , their overexpression could represent a resistance mechanism in colorectal adenocarcinoma. Flow cytometry analysis shows that the resistant cell line LS1034 overexpressed Pgp in the plasma membrane and in intracellularly. This finding confirms the resistant phenotype described  for this cell line, as the association of Pgp overexpression with MDR as been well established by different studies using cell lines . To confirm Pgp expression for both cell lines Western blot was used. The comparison between different samples is done by observing staining intensity for the band corresponding to Pgp (molecular weight of 170 kDa). While no staining intensity was observed in the sensitive cell line, WiDr cells, it was observed in LS1034 cells. β-actin staining (molecular weight of 42 kDa) confirmed that equal amounts of protein were applied into the gel, making the direct comparison between samples possible. These results are consistent with those obtained by flow cytometry, confirming the overexpression of Pgp in the resistant cell line and, therefore, its resistant phenotype. After characterizing MDR proteins expression, we accessed if 99mTc-Sestamibi could be used as a probe for their expression in our cells lines. Its uptake and efflux kinetics could be influenced by the expression of these proteins but also by cell mitochondria density and by membrane’s physical properties. Here, we compared uptake and retention curves in both the sensitive and the resistant cell line in order to determine if 99mTc-Sestamibi is a good probe for MDR transporter function in colorectal adenocarcinoma cell lines. Although Pgp and MRP-1 only have 15% of homology in aminoacid sequence  and have different transport mechanisms, it is known that these proteins transport a similar spectrum of substrates , being 99mTc-Sestamibi one of them, and so kinetic studies were performed [18,27]. The same studies were performed using different ABC-transporters modulators, verapamil and BSO, in order to access MDR reversion in the resistant cell line. The uptake kinetic studies using 99mTc-Sestamibi showed a higher uptake in WiDr when compared with LS1034 cells. This radiopharmaceutical’s uptake occurs by passive diffusion and due to transmembrane electric potential, accumulating also in mitochondria . Therefore, its uptake can be influenced by mitochondria density within the cell and membrane physical properties. However, when cells are resistant, efflux occurs simultaneously with uptake, not allowing 99mTc-Sestamibi to diffuse into the mitochodria, which can lead to a lower uptake percentage of this radiotracer in cells which overexpress ABC-transporters. Therefore, the higher expression of Pgp detected in LS1034 cell line can justify the lower uptake percentage observed in kinetic studies, results that are consistent with those described in literature for other cell lines [18,28-34]. Retention studies using the same radiopharmaceutical showed a lower retention percentage for the resistant cell line, with a faster extrusion from the cell. This result is also correlated with the higher expression of ABC-transporters observed in LS1034 cell line, as their overexpression could lead to a faster and ATP-dependent efflux of 99mTc-Sestamibi. These results are consistent with those found on literature [18,28]. The faster extrusion observed for 99mTc-Sestamibi is related to the resistant phenotype described for these cells. This is in agreement with that occurred with cytotoxic drugs, that could also be transported out of the cell before having the desired effect. The main strategy to overcome MDR is the use of modulators and/or inhibitors of efflux pumps. In this study we used a first generation MDR modulator, verapamil, a substrate for Pgp known to modulate its activity by competitive inhibition, as well as MRP-1 function [28,35]. We also used a γ-glutamylcysteine synthase inhibitor, BSO, in order to inhibit MRP-1 function, as it depends on glutathione to transport many substrates. 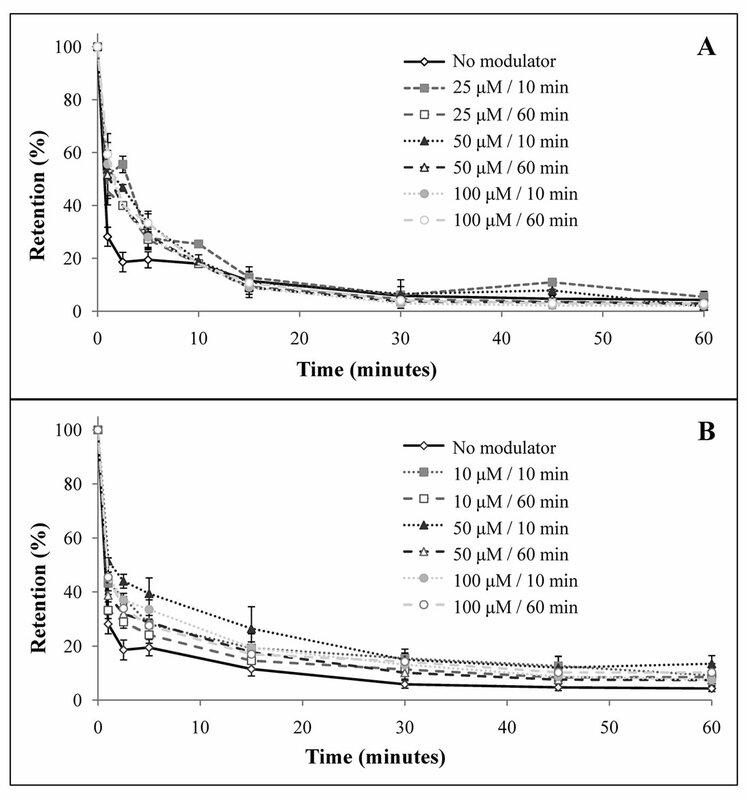 Retention studies using these modulators showed a difference in the retention percentage between the resistant cells incubated without any modulator and those incubated with each one of the previously referred drugs, for the first five minutes after incubation with 99mTc-Sestamibi (Figure 5). However, retention curves tend to overlap, as the studies proceed. This result could represent a reversion for the first minutes after incubation and does not seem to be dependent on time of incubation and concentration of both modulators used. Utsunomiya et al. performed retention studies in a nasopharyngeal carcinoma cell line, in the presence and absence of several MDR modulators, including verapamil and BSO, using 99mTc-Sestamibi. Incubation with both these modulators resulted in a lower efflux percentage at 20 minutes after incubation with the radiotracer, comparing to control cells . Studies performed by Gomes et al. in osteosarcoma cell lines also showed higher 99mTc-Sestamibi retention through time in cells incubated with these modulators, when comparing to controls . In our study, however, the reversion induced by these two modulators was only verified for a short period of time. This could be explained by the involvement of additional transporters in efflux of this radiotracer, leading to a lower reversion on the retention rate in LS1034 cells. The mechanism of action of BSO is the depletion of glutathione in the cells, therefore inhibiting the function of MRP-1 . Since flow cytometry analysis showed both cells to be negative for the expression of MRP-1 this could explain the overlapping of the curves that occurs when BSO is used as a modulator. Another factor that may influence the results obtained is the period of incubation with BSO . In this study we observed that the MDR protein Pgp is overexpressed in the colorectal adenocarcinoma resistant cell line LS1034, when comparing to sensitive WiDr cells. This result was confirmed using two different techniques, flow cytometry and western blot. Kinetic studies comparing both cell lines showed a lower uptake and retention percentages of 99mTc-Sestamibi in the resistant cell line LS1034, which are related to the higher expression of efflux pumps in this cell line, as these proteins can promote a faster extrusion of different substrates, including 99mTc-Sestamibi. Regarding MDR modulation retention studies performed in resistant cells, we observed a higher retention percentage in cells incubated with verapamil and BSO for the initial minutes, when comparing to that observed in the same cells incubated with none of the modulators. Retention curves tended to overlap over time, indicating that these findings could represent a reversion for the initial minutes after incubation with the radiotracer, which does not seem to depend on time of incubation or concentration of any of the modulators used. In summary, we established a correlation between efflux pumps expression and the retention of 99mTc-Sestamibi within colorectal adenocarcinoma cell lines. Therefore, in vitro kinetic studies could indicate MDR phenotype in this type of cells. As the modulators used during these experiments showed a reversion of the retention profile only for the first minutes of the retention studies, their administration should occur immediately before the administration of cytotoxic drugs, so that they can take the desired effect. A. Stavrovskaya, “Cellular Mechanisms of Multidrug Resistance of Tumor Cells,” Biochemistry (Moscow), Vol. 65, No. 1, 2000, pp. 95-106. J. Ford and W. Hait, “Pharmacology of Drugs that Alter Multidrug Resistance in Cancer,” Pharmacological Reviews, Vol. 42, No. 3, 1990, pp. 155-199. R. J. Scheper, H. J. Broxterman, G. L. Scheffer, P. Kaaijk, W. S. Dalton, T. H. van Heijningen, C. K. van Kalken, M. L. Slovak, E. G. de Vries and P. van der Valk, “Overexpression of a M(r) 110,000 Vesicular Protein in Non-P-Glycoprotein-Mediated Multidrug Resistance,” Cancer Research, Vol. 53, 1993, pp. 1475-1479. D. Piwnica-Worms, M. L. Chiu, M. Budding, J. F. Kronauge, R. A. Kramer and J. M. Croop, “Functional Imaging of Multidrug-Resistant P-Glycoprotein with an Organotechnetium Complex,” Cancer Research, Vol. 53, No. 5, 1993, pp. 977-984. I. Gil-Ad, A. Zolokov, L. Lomnitski, M. Taler, M. Bar, D. Luria, E. Ram and A. Weizman, “Evaluation of the Potential Anti-Cancer Activity of the Antidepressant Sertraline in Human Colon Cancer Cell Lines and in Colorectal Cancer-Xenografted Mice,” International Journal of Oncology, Vol. 33, No. 2, 2008, pp. 277-286. S. G. Smith, N. L. Lehman and R. G. Moran, “Cytotoxicity of Antifolate Inhibitors of Thymidylate and Purine Synthesis to WiDr Colonic Carcinoma Cells,” Cancer Research, Vol. 53, No. 23, 1993, pp. 5697-5706. Y. L. Lin and K. C. Chow, “rTSbeta as a Novel 5-Fluorouracil Resistance Marker of Colorectal Cancer: A Preliminary Study,” Annals of the Academy of Medicine, Vol. 39, No. 2, 2010, pp. 107-111. D. E. Lorke, M. Krüger, R. Buchert, K. H. Bohuslavizki, M. Clausen and U. Schumacher, “In vitro and in vivo Tracer Characteristics of an Established Multidrug-Resistant Human Colon Cancer Cell Line,” Journal of Nuclear Medicine: Official Publication, Society of Nuclear Medicine, Vol. 42, No. 4, 2001, pp. 646-654. A. Cayre, N. Moins, F. Finat-Duclos, J. Maublant and P. Verrelle, “Comparative 99mTc-sestamibi and 3H-Daunomycin Uptake in Human Carcinoma Cells: Relation to the MDR Phenotype and Effects of Reversing Agents,” Journal of Nuclear Medicine: Official Publication, Society of Nuclear Medicine, Vol. 40, No. 4, 1999, pp. 672-676. C. L. Crankshaw, M. Marmion, G. D. Luker, V. Rao, J. Dahlheimer, B. D. Burleigh, E. Webb, K. F. Deutsch and D. Piwnica-Worms, “Novel Technetium (III)-Q Complexes for Functional Imaging of Multidrug Resistance (MDR1) P-Glycoprotein,” Journal of Nuclear Medicine: official publication, Society of Nuclear Medicine, Vol. 39, No. 1, 1998, pp. 77-86.